Can AMR deliver a technical tour-de force that sounds just as good as it looks? OOHS, AND AAHS. That’s what I got from assembled family members when I released the Abbingdon Music Research digital processor and preamplifier known as the DP-777 from its cardboard prison. When viewed in the flesh, it’s a sumptuously styled and heavyweight masterpiece of aluminium goodness. But looks aren’t everything. So what’s it got? This dedicated 2-channel preamp/processor includes in-built D/A conversion from both USB and conventional SPDIF/Optical transports, although it’s the USB option that rates as the best possible connection. It’s also a full 24 bit/192Khz USB 2.0 Audio Class device, the first I’ve had the pleasure of listening to and based on the A/B listening tests I did (vs. SPDIF and optical) it most definitely is the way forward, with better midrange transparency and improved timing. Not great leaps and bounds mind you, but certainly a palpable improvement over the conventional digital inputs. The cultured AMR packs so much technology under the hood (most it proprietary to AMR) that it’s easy to get caught up in and confused by the gobbledygook. 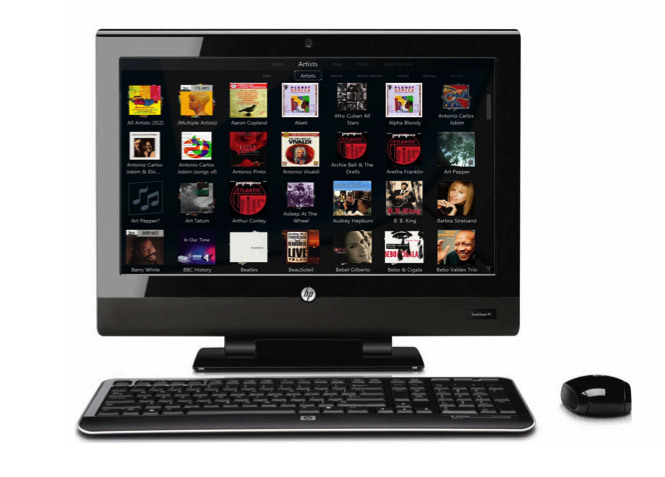 For starters, the company has created its own DAC – the HD Gemini Digital Engine. Unusually, the DAC is actually a combination of two different D/A converters – an HD 32 bit DAC and a classic 16 bit chipset. How they mate together is a bit beyond my ability to explain it (technical papers are available on AMR’s website for those with the hunger) but AMR certainly are the only manufacturer to do this, in my experience. 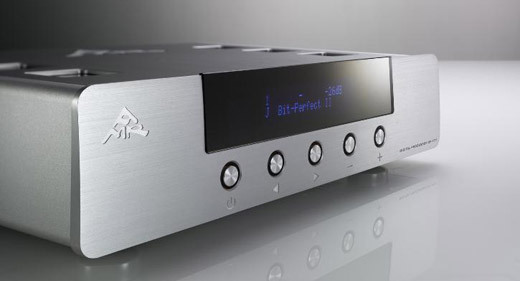 Accompanying the unique DAC is AMR’s digital filter technology, spearheaded by their ‘Organic’ setting. Promising near elimination of so-called ‘digital ringing’, it was written by company propellerheads in order to create as natural a sound as possible – free from digital artefacts and audible hash/glare. GMT (Global Master Timing) technology re-clocks the data from all digital inputs, thus reducing jitter to an absolute minimum, while the aforementioned Asynchronous USB input allows data streams of up to 24/192 from either a Mac or PC. A state-of-the-art digital processor with valves? Bitperfect output from transport to output stage is the nirvana of most in the world of quality digital audio, but according to AMR few achieve it – so they’ve created the DP-777 with ‘Bit Perfection’ to ensure unaltered transmission of the data at its original bitrate and sampling frequency. Both SPDIF inputs use a vacuum tube stage to tidy up the digital waveform, giving the music back the ‘life’ missing from all other DACs (according to AMR, anyway). 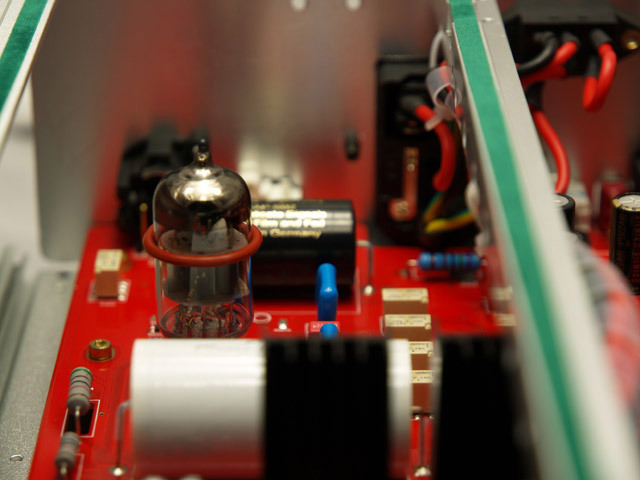 A tube analogue output stage ensures a continuation of the intended ‘vinyl-like’ sound quality the designers were aiming for. 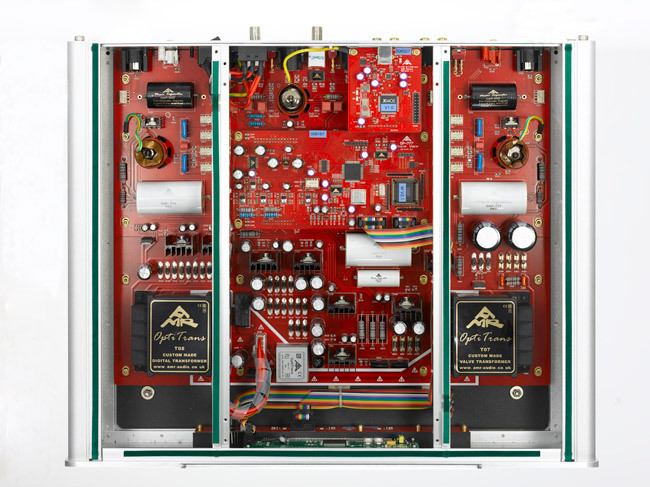 Outputs are either via XLR or RCA to your power amplifier of choice, but that needs to be a pretty good unit if you really want to get the best out of the DP-777. For the tests I used my Audiolab 8200MB mono amplifiers which are pretty good, but I’d be setting my sights a few rungs up the food chain if I were to be completely honest with myself (and I am, I said, I am). 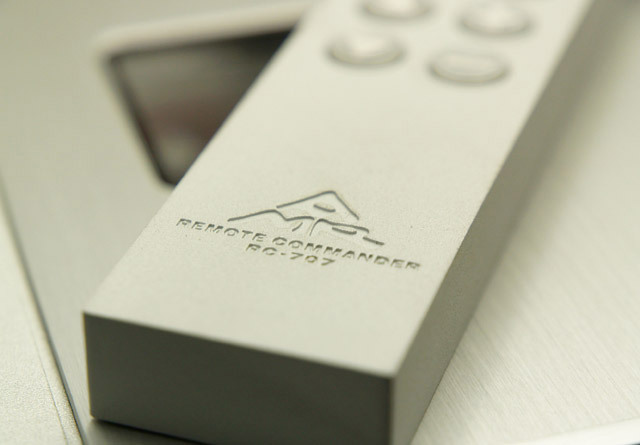 And then there’s the matching remote control, itself a chunky slab of indestructible aluminium reminiscent of the Plinius weapons of mass destruction (got burglars – keep a Plinius remote handy) from a few years back. Loudspeakers were divided between my very awesome Voigt ‘Vofo’ single driver masterpieces, a pair of Dynaudio DM 3/7’s and my trusty Castle Harlech floor-standers. My well carpeted/furnished room has a miraculously great ability to make just about any component or system sound above average, but it was quickly established that I was hearing things hitherto unknown via the gorgeous AMR. Not that the detail on offer was the only improvement; the music had more ‘swing’ and I found myself not wanting to drag myself off the couch to do important tasks, let alone the more menial aspects of home/family life. Chris at Feedback Audio had kindly sent an external HDD chock full of hi-res albums and well recorded 16/44 stuff, and I simply gorged myself on a swathe of classical, jazz, blues and pop/rock. I won’t dwell on the supplied AMR’s ‘all-in-one’ HP computer server, as it isn’t the hero of this review, but suffice to say it was optimised for audio-only and ran the latest version of the popular J-River music software to great effect. Downloadable apps for Android/Apple phones and tablets made for a pretty seamless and effective solution in combination with the DP-777 without actually having to sit next to the server or jump up every 40 minutes to change albums. I found the JRiver server a breeze to navigate using the nice touchscreen (like a Squeezebox Touch on steroids) and this made for a pretty easy-going setup, the only bugbear being that you will have to position the server close to the AMR – USB does have limitations with distances over 3m (1.5m is close to the theoretical ‘perfect’ length for audio transmission). After setting up both the DP777 and server in my system (not a difficult job) it was down to some serious listening. I decided to confine my appraisal based on the music I know and love contained on my Mac – a splattering of red-book and hi-def (mainly purchased from HDTracks and my own 24/96 vinyl rips, along with some sample 24/192 tracks). These were imported onto the HP server so I was able to do proper A/B comparisons with my lowly Squeezebox Touch. From the get-go there was a noticeable drop in the noise floor compared with the Touch. This was the most obvious difference (but not the only one) – quiet passages from Beck’s Sea Change (24/88.2) were just that: songs appeared out of an inky darkness without any sort of hash or glare. That’s not to say the Touch is guilty of the aforementioned, but the 777 definitely had the edge in terms of transparency in this regard. I love this album and know it intimately, the AMR/server combo brought the music to life in a way I hadn’t heard it previously. Beck’s vocal seemed larger and better centred between the speakers, while stereo effects had more drama and dynamics. There appeared to be better detail, the strings on Lonesome Tears had better definition (I could pick out individual instruments – viola/cello/violin were easier to ‘spot’ in the recording). Bass resolution was a closer tussle, the 777 just edging out the beer-budget Logitech in terms of slam and pace. Female vocals are a tough act for any hi-fi to reproduce, and that’s where I went next with Rebecca Pidgeon’s The Raven. Not surprisingly the AMR reproduced this hi-res recording exceptionally well, and Rebecca’s vocals came through quite beautifully. The sparse title track is basically piano, strings and vocal and the quality of sound was simply gorgeous. Pitch-perfect sustained piano notes and unwavering solo violin combined with the artist’s vocal kept me pinned to the couch. An exceptional result considering I usually find the album as boring as hell. My 24/192 DVD-A rip of Neil Young’s Harvest was next on the block (thanks DVD-A-Extractor) and here the 777 really showed a clean pair of heels to the Squeezebox Touch with a stunning portrayal of this iconic album. The massed strings and piano on ‘A Man Needs A Maid’ just filled my listening room up, while Neil’s plaintive vocals (that’s one way to describe them) had pathos and drama aplenty. It’s a bit of a cliché’, but I was hearing things I hadn’t heard before in the recording, such was the resolving ability of the DP777. As clean as the sound quality was, it didn’t lose sight of the performance. I’d describe it as an un-audiophile sounding pre/server combo that just delivers the sonic goods, allowing the listener to get on with the enjoyment of music. Thanks for review of the DP777. Did you compare it to a stock or a modified Logitech Touch? Hi Larry, the Touch is unmodified – I’m even using the stock switch mode PSU. I’ve now installed a 24/192 plugin that will also allow this resolution via USB, however I’m using the SPDIF coax into my Audiolab 8200CDQ and it sounds great. Can a hot-rodded Touch match something like the AMR & server? I’m a ‘touch’ dubious to be honest! The sound is good, but the DAC breaks down. I had to sell mine because it kept breaking and there are countless other cases written about it online. These things are brittle. In my experience, a broken multi-thousand dollar DAC is just a total waste of money. Hope this genuinely helps people in their purchasing decision.